So far in 2013, Kenny has placed twice at the Latte Art World Championship Open at CoffeeFest (both in New York and Chicago) and won the Latte Art Exhibition at SCAA in Boston. Currently the US is not represented at the World Latte Art Championship, but the Latte Art Exhibition at SCAA paved the way for future American involvement. Although Kenny won’t be able to represent the USA on the global stage this year, he did win a very impressive home espresso machine set up, valued at over $4,000 dollars. Not too shabby for pouring a little steamed milk into espresso! We caught up with Kenny back in Louisville and asked him what it was like to win such a prestigious event and what lies ahead. The SCAA Latte Art Exhibition is a little different from your typical throw down. Walk us through the competition. It was quite different than a traditional throwdown, more than I realized to be honest! I’ll give you fine folks the play-by-play, I actually began to enjoy it more as each round passed. There were two first rounds, one on Friday and one on Saturday morning. These were set up identically to a typical head-to-head competition but with a twist; the judges tell you what design to pour and in what size cup. My given instruction was to create a heart in an 8oz tulip-shaped latte cup. I knew I needed to get a little creative to do well so I went for a hard-pushed 3-layer tulip that formed a heart on draw through. Second round was completely different. We each got a 10 minute warmup to produce one design of our choice which the judges photographed. We then had 5 minutes to produce 2 more of the exact same pour which would be judged based on the photograph and in relation to one another. This round also included a score for interaction with the judges and professionalism. The top 8 were chosen out of the 17 in round 2 based on those scores. In the finals they took things 1 step further. This time we got a 30 minute (!) warmup, during this time we had to produce a macchiato, cappuccino, and 8oz latte with designs of our choice, each would be photographed for competition time. After warmups were complete we were given 10 minutes to re-pour 2 each of those 3 designs. During our 10 minutes we had a tech judge standing over our shoulder scoring us for things such as waste, towel use, cleanliness, and shot times. We were also evaluated on our judge interaction in this round but the biggest chunk of points hinged on our ability to consistently replicate all 3 designs within the given time. It was intense! Here is a link to the score sheets from the finals to give you an idea of the points breakdown: visual, technical. Did you have a pre-planned strategy or did you just wing it? It's been a heckuva weekend but, as Nelly Furtado once told us, all good things come to an end. 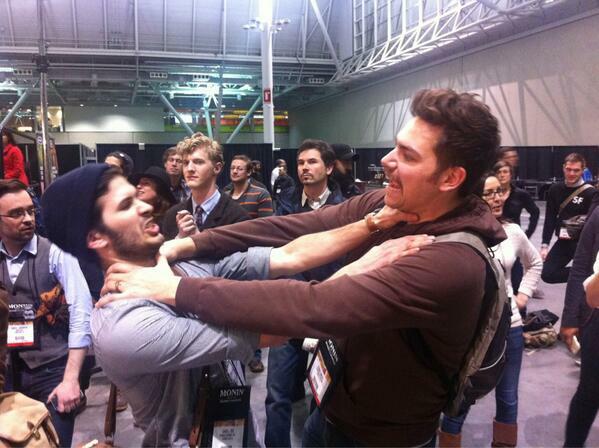 Let's take a teary-eyed look atwhat happened on our last day at Coffee Fest Chicago. You had to pour 3 macchiatos in the final round. Is that something you typically practice on bar? I almost never pour macchiatos, but it was fun to be challenged in a way that I’m sure many of us who were competing weren’t accustomed to. As you can probably tell from competitions like coffeefest (local throwdowns too) the 6oz Capp reigns supreme; this is true for me as well. What was going through your head when they announced the winner? Haha, honestly after they announce Charles Babinski as 2nd place I was thinking “I either won this whole thing or didn’t even place!” In my head there was a 50/50 chance, though my confidence was given a boost by Cabell Tice telling me that he thought I had won while awaiting the announcement. You’ve come in second twice and third once at the Latte Art World Championship Open, the competition held at CoffeeFest. What was it like to finally win a competition? I was super thankful for it, it was a fantastic experience. It definitely satisfied some of that “itch” that all who compete have to land a 1st. It was much different than CoffeeFest too, in some ways it feels like a bigger win but I don’t think it has the momentum of CoffeeFest yet. We saw a picture of you and Cabell Tice choking each other. 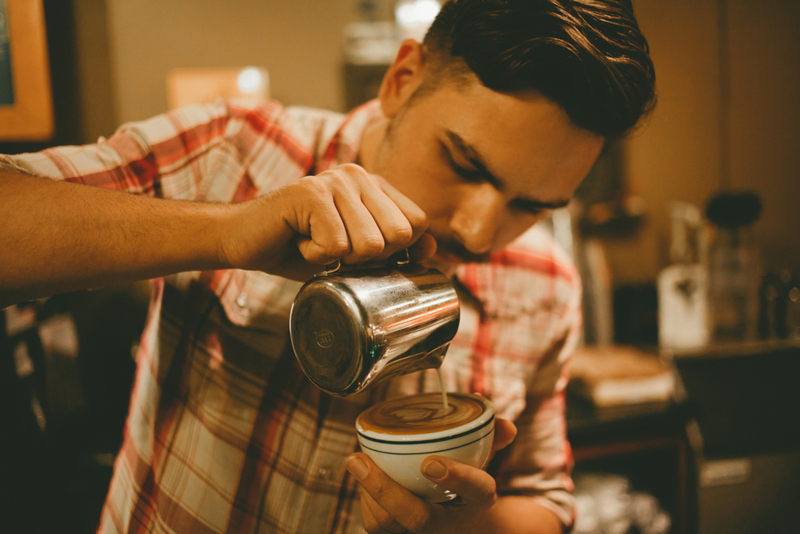 Is he your latte art nemesis? That’s a lie, Cabell and I have become good friends through competing together and he is someone who I always look forward to seeing. I don’t think I have more fun competing against anyone than Cabell, he is excellent at his work and has a great heart. Both of us have a similar perspective on competition so it takes some of the pressure out of being competitive. Every barista dreams of having an espresso machine at home. What’s your plan for the grand prize? Is it going in your kitchen or the pawn shop? Can we come over and use it? Any aspirations for the future? 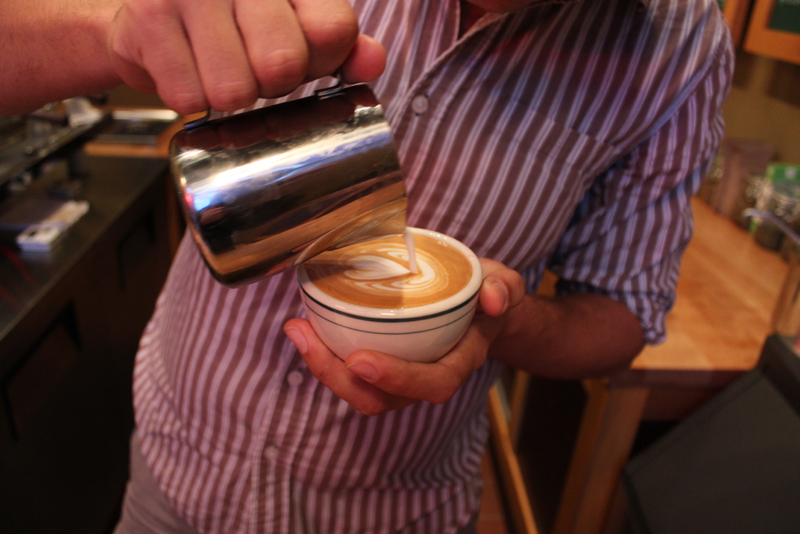 Are you sticking with latte art or do you plan to try another competition? Well I just got back from Chicago’s CoffeeFest, Cabell and I got our rematch! Other than that I intend to begin what I’m sure will be many years of battling other baristas in the regional barista competitions. This will be my first year but I am super excited. I don’t really have any crazy aspirations of winning at this point, lots of tough and amazing competitors in USBC. I’m sure it will be an experience to remember no matter what happens. Great read! Kenny, brother, well done as always. Hope to see you on 5th street again soon. Very few things compare with walking into Sunergos and walking out with a perfect latte!